US engineering company and aftermarket specialist Blackhawk Modifications has received Canadian supplemental type certification for its XP67A engine upgrade on the Beechcraft King Air 350, and is preparing to begin work on the first retrofit for a local customer. An engine upgrade for the King Air 350 by Blackhawk Modifications, based in Waco, Texas, is now certified by the FAA, the company announced this week. 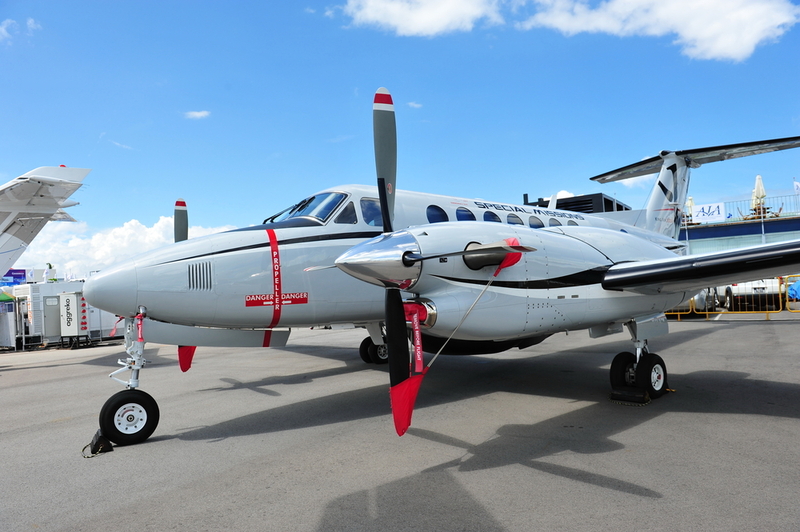 Beechcraft today announced the introduction of the Pratt & Whitney Canada PT6A-67A engines to boost performance for its King Air 350HW and 350ER twin turboprops. The Textron subsidiary also is now offering an increased maximum takeoff weight of 17,500 pounds for the two models. Both modifications are now approved by the U.S. FAA and EASA and are available as factory options for new aircraft, or as retrofits. The work can be done by any of Textron’s 19 company-owned authorized service centers. The more powerful PT6A-67A engines provide superior takeoff and climb performance, including hot and high operations. With an outside air temperature of 50-deg C (122-deg F), the engine upgrade allows for a maximum takeoff gross weight increase of up to 2,700 pounds at sea level, compared to the standard aircraft. The increased gross weight option provides operators greater flexibility between payload and fuel, representing a potential increase in loiter time of two to three hours. The 350HW is the heavyweight version of the King Air 350, providing increased load-carrying capability thanks to its larger and stronger main landing gear struts, wheels, tires and brakes. The 350ER is the extended-range version with more fuel capacity through the addition of low drag metal fuel tanks aft of the powerplant. With NBAAIFR fuel reserves, its max ferry range is 2,690 nautical miles (4,982 kilometers), and it can also offer an endurance time of 12 hours for surveillance missions. Beechcraft (Stand A21) also is promoting its Grand Caravan turboprop single for special missions work, billing it as a sound value proposition for a variety of operators thanks to its low operating and acquisition costs. “In the Middle East at large we [Textron] have nearly 150 [Citation] business jets and 160 turboprops, and about half of the turboprops are being used for special missions work, including surveillance,” Gibbs told AIN. The Caravan can carry between 10 and 12 passengers or a mix of equipment for multi-role operations including medical evacuation. It offers range of up to around 1,000 nm (1,852 km). “The aircraft is very maintainable; with no pressurization or hydraulics, it is a very simple aircraft and has a low fuel burn of around 65 gallons per hour at cruise. That’s about one-fifth of [the fuel burn] of a light helicopter,” Gibbs explained. “The basic aircraft, which has an endurance of around six to seven hours on station, costs under $3 million, or between $4 million and $6 million equipped. Both the Caravan and the King Air 350 can operate from rough strips. The examples on display here at the MEBAA show are the Grand Caravan EX model and the King Air 350i.